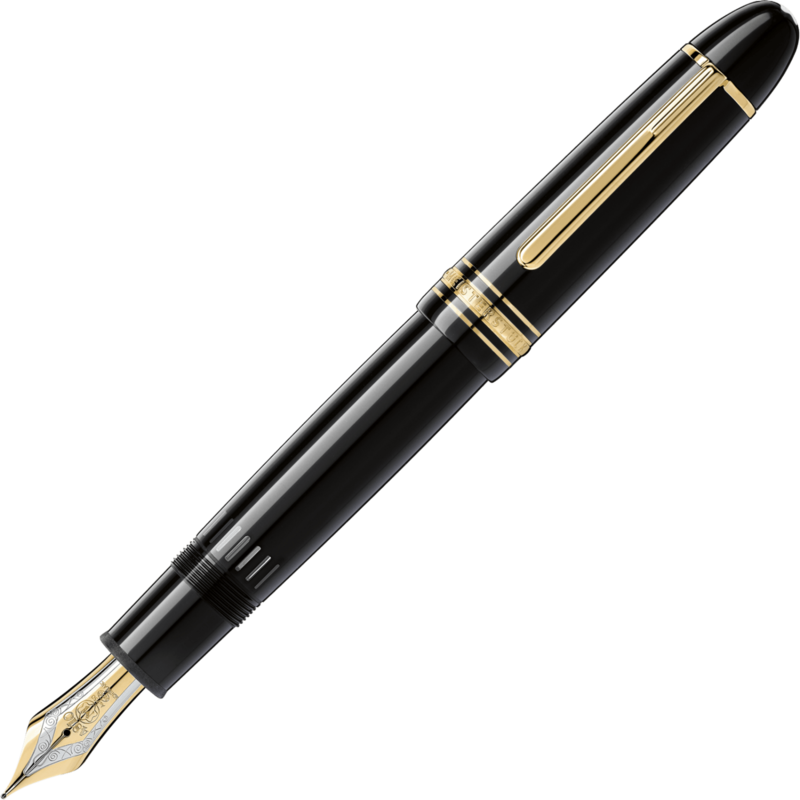 In an effort to educate readers about fountain pens, I have embarked on a series of articles about their technical aspects. In last week’s article, I listed the three factors that affect the writing experience with a fountain pen: the nib, the ink, and the type of writing paper. The nib provides the baseline scratchy/smoothness that must be taken into account when you are writing. While a nib that is truly a dud can be tweaked or replaced by a nibmeister, for our purposes, the nib is the “given” that can’t be easily changed. Ink and paper, on the other hand, can be varied quite easily. Changing the ink in a pen is as easy as buying a new cartridge, or using a converter with a different ink. Paper, too, has a lot of variances. Paper that you find in a copier or laser printer isn’t high-quality stuff; it only takes a bit of looking to find pads from Rhodia or Clairefontaine that are more accepting of fountain pen ink. Based on my experience with finicky nibs, I have found that in most cases, my complaints (writing is too scratchy, line is too thick) were complaints about how a particular ink interacts with a particular nib. So, before chucking that pen that’s giving you an unpleasant writing experience, let’s look at little more closely at the role ink plays in the pen. 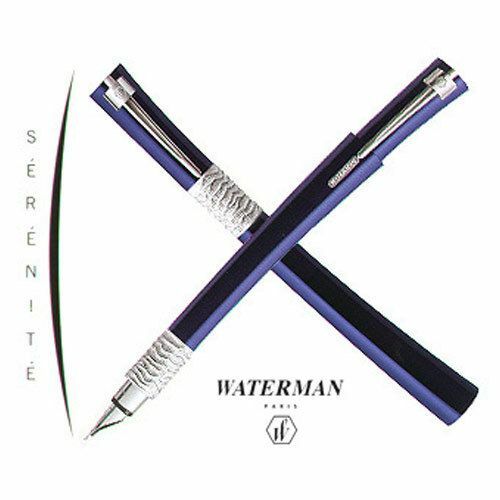 No two fountain pens are alike. How the tip of the nib is ground, or how the tines slope toward the tip accounts for some of this uniqueness. The other factor is the pen’s feed system. The feed system is the mechanism through which ink is delivered to the tip of the pen. If you look at a demonstrator fountain pen–a pen that is entirely clear so you can see its innards–you can see that a pen has fairly simple parts inside it. It has a reservoir of ink and a comb-like piece of plastic that stretches from the body of the pen to near the tip of the nib. This comb is the feed system. 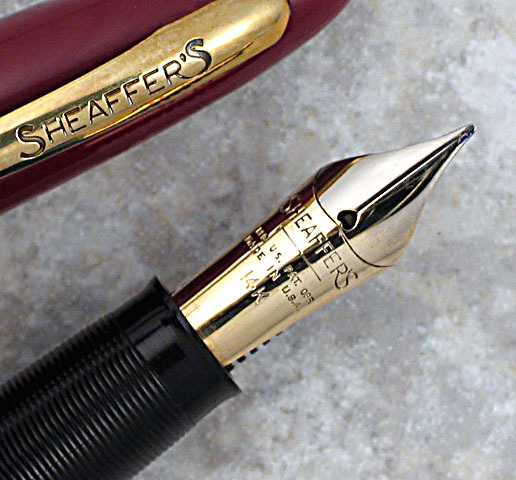 On many modern fountain pens, the feed is visible under the nib. On certain pens, like the Waterman Carene or Parker 100, there is a smooth underside to the nib; the feed is hidden behind plastic. The feed brings ink to the tip of the pen. The breather hole on the nib allows air to flow back into the ink reservoir to replace the ink flowing to the nib. This feed system is designed to work at standard pressure. At cruising altitude on a plane, the air-exchange can cause leaks or breaks depending on the quality of the feed. It is good to be cautious when traveling and store fountain pens upright either completely full or empty (I prefer empty) to avoid complications with the feed system. Feeds are often marked more by when they go wrong than when they are functioning. Feeds can sometimes become misaligned to the nib, causing all sorts of fun problems like start-and-stop blobby writing. Flipping a pen over, the feed should be centered on the fountain pen tines. If it is skewed to the side, you can usually gently push it back into place with a finger. A properly functioning feed should be fairly invisible–not a part to fret about. When a feed goes wrong, usually the pen must be handed over to a professional for repair or replacement. Because the feed system is a part that can’t be tweaked without considerable expertise on most modern pens, it is much like a pen’s nib. These are factors that you have to work around. Depending on the characteristics of the feed system and the nib, a fountain pen will interact with inks in different ways. Some inks may move through a nib sluggishly and provide for a dry, scratchy writing experience. Some inks may be very liquid and provide a very wet line. Reviews can point you towards which inks are more likely to provide an enjoyable writing experience. A good ink reviewer will provide visuals of writing with the ink. Most reviewers will provide samples of the ink from different pens/nibs or on different papers. 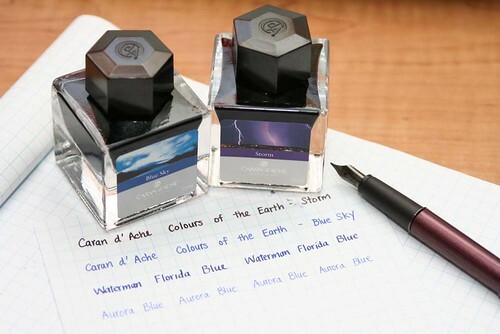 A color that strikes your eye is the starting point for selecting an ink. This is important. If an ink doesn’t look good on the page, you aren’t going to want to write with it. Depending on what a user is looking for, there are a variety of considerations that go into choosing an ink. An ink that “Works well” is a personal standard. It is usually based on qualities like the ink’s dye on a page (is it a dark, saturated color? ), how well it flows from the nib (is it a dry or hard-starting ink? ), and if it provides the thickness of line desired by the user. Some drawbacks to inks are “feathering” (when the ink spreads on the page unintentionally) and “nib creep” (when the nib spreads out over the fountain pen nib, possibly corroding or staining the nib without proper care & wiping the nib). For those who wish to use fountain pens to sign documents, there are waterproof inks called “bulletproof” by Noodler’s Ink. These inks are cellulose-reactive inks that become water-proof and bleach-proof when they come in contact with paper. The drawback to bulletproof inks is that they can be hell to get out of clothing. If you’re a bit liberal with the ink as I am (and end up with spots of it in strange places), bulletproof inks can be hell on clothing. Almost all fountain pen users have a favorite ink that they find works well in most fountain pens. My ink of choice is Private Reserve’s Ultra Black. I love how dark the ink appears on a page (it is one of the deepest blacks I’ve found), and it moves through most nibs fairly well. It provides a wet line on most papers. Although it has the tendency to feather (little lines spread from the original line) on papers that aren’t up to a certain quality, I prefer the super-dark line more than I care to find an ink that feathers less on cheap paper. For fountain pen users starting out, Private Reserve is one of the low-risk inks that I encourage users to try. They have an excellent range of colors, a neutral pH (and thus won’t corrode a nib), and are fairly free-flowing inks. As I have said before and will repeat ad-nauseum: no two pens are alike. Even if they are the same model. Two Four-Leaf Clover Montaguts with the exact same outwards proved this point to me quite clearly last year. One nib was smooth as butter, the other was scratchy out of the box, and was only approached the smoothness of its sibling with diligent care. My solution to this problem was to change out my usual ink, Private Reserve Ultra Black, with Noodler’s Borealis Black. The Borealis Black smoothed over some nib issues, but finally, I simply choose to use the smooth-nibbed Montagut and give the scratchier nib away to a budding pen collector who was branching out into new types of pens. Changing inks can change your writing experience for the better, but it can only modify the baseline of the nib. I have spoken at length about the anatomy of fountain pens in this series: how to identify interior parts, how the feed system works, how ink interacts with nibs. My main theme has been function over style because it’s all too easy to get sucked into a pretty carbon-fiber or tortoise shell barrel without thinking about the most important bits. But there are points of style that can’t be ignored when thinking about functional pens. Style is the first consideration that I make when I reach for a writing instrument. When I write my daily journal pages, I want a cheerful, well-flowing pen to keep my mood light. If I am drafting the first scene of a novel, a no-frills pen that’s a hard-worker is my go-to selection. For editing, a pen that won’t dry out while its uncapped is my choice. These considerations aren’t so much about how a pen looks, as they are about how the pen nib is styled. There are three main styles of nibs: an open nib, an inlaid nib, and a hooded nib. The open nib is the standard nib that you see on 95% of modern fountain pens. It is called an open nib because you can see every part of the nib (it’s narrow base, the flare of its shoulders, the breathing hole, and its tines). The nib protrudes from the pen body to draw attention to itself. Open nibs can be plain or ornamented with filigree because their design is meant to impress. Open nibs can suffer from ink drying out if it isn’t in use. Their open design often allows nibs to be easily replaced or tweaked if the feed system goes awry. It’s no wonder that the open nib is so popular; the brazenness of a bare nib sets fountain pens apart from ballpoints. While the open nib is the most popular of all nib styles, I prefer variety in my nibs. As a fan of both ballpoints and fountain pens, I don’t feel the need to flaunt open nibs if they don’t suit the pen design (and I honestly feel like most pen design isn’t served by sticking to standardized open nibs). I keep an eye out for open nibs that aren’t of the standard shape or size. The Lamy Studio has an open nib in a non-standard style; its short rectangular nib integrates into modern angles of its body. Hooded nibs are the exact opposite of open nibs. They are also incredibly rare on modern Western pens. The nib’s body and shoulders are covered by a piece of plastic or metal. A hooded nib often doesn’t look like a nib at first glance. The hood has two advantages and a feature that’s seen as a drawback. It keeps ink from drying out quickly on an uncapped pen and it allows a writer to grip the pen close to the tip. For people with small handwriting or just a desire for precise motion, the hooded nib is appealing. The drawback feature is that the hood creates a rigid nib. Rigid nibs are uniform in writing—almost like a ballpoint. For people who buy fountain pens for flex, or for the gentle swooping change of thick-to-thin lines, hooded nibs don’t provide those lines at all. It shouldn’t be a surprise that I am a great fan of hooded nibs. I write at length and for a variety of business purposes. I prefer a pen that will take to being uncapped, and will write with relative uniformity. The small, thin lines that can come from a hooded nib are fantastic for making small notations (for this reason, hooded nibs are sometimes sold as “accountant nibs” online). Finding a good hooded nib is difficult because of their relative rarity. The most popular hooded nibs are found on vintage Parker 51 and Parker 61 pens. Chinese pen maker Hero makes an array of Parker 51 clones that hold up well to everyday use. 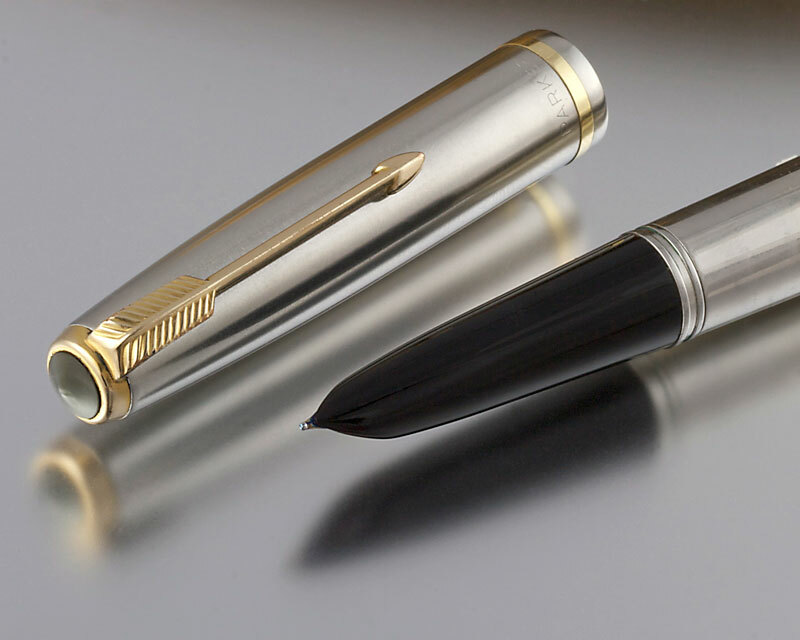 For a new twist on the hooded nib, Namiki-Pilot’s Vanishing Point pen has a retracted hooded nib. The last nib style is the halfway point between a hooded and an open nib. Like the open nib, the inlaid nib is visible from the top. Like the hooded nib, its feed system is hidden by a piece of plastic or resin and not easy to repair. The inlaid nib gains some of the dependable uniformity of the hooded design because it is usually mounted on a pen body. It, however, remains a style fixture in modern fountain pen manufacture because it celebrates the presence nib as a design feature. Inlaid nibs are often integrated into the pen body in astonishingly sleek designs. An inlaid nib is unforgettable. Unfortunately for pen aficionados, inlaid nibs are even rarer than hooded nibs, as there are not as many vintage inlaid nibs pens as popular as the Parker 51, nor are there a flood in inlaid nib clones on the market. My earliest experiences with fine fountain pens were with an inlaid nib. It should be no surprise that the Waterman Carene that I’ve spoken highly of on this blog have inlaid nibs. The Carene is one of the few non-vintage inlaid nibs on the market. Other inlaid nibs are pseudo-inlays, like the Montegrappa Nerouno Linea (the nib juts beyond the pen body, so it is not a proper inlaid nib), or have been discontinued, like the Cross Verve. A collector can usually find vintage or discontinued inlaid nibs at a price. 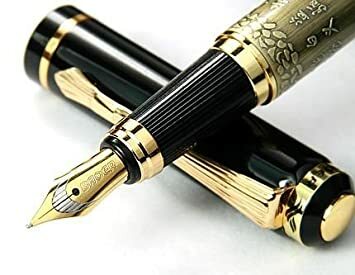 If an inlaid nib is the object of your attention, finding a list of pens with inlaid nibs can usually be found on fountain pen collector message boards. Nib style can be an important stylistic decision to make, though one that’s usually made for the pen already given that the majority of pens have default open nibs. Despite my own quest for variety, there is nothing wrong with an open nib. Most fountain pen buyers start out with open nibs. Only after buying a few pens do debates over the suitability of open and hooded nibs arise among collectors. What it boils down to is this: open nibs are the gold standard, but hooded nibs are worth a try for their workman-like dependability. Inlaid nibs carry a hefty price tag but are incomparably gorgeous.